← Alas – Home Again! This dish resembles the quick and easy Hamburger Helper of prediagnosis days, but has a richer flavor. My husband said it tasted like Pizza Pasta (a box mix he used to get when he was a bachelor). The preparation time is short and the baking time only about 25 minutes. Preheat oven to 350 degree. Grease a 2-quart casserole. Cook the pasta to slightly less than done (package time was 15-16 minutes, I cooked mine for 13 minutes). Drain and set aside. In a large skillet, brown the ground beef and cook until browned. Add the pasta sauce, rinsing the jar with the 1/2 cup water to add to the sauce. Add the V8 juice and the mushrooms, drained. Stir in the basil, oregano, and sugar. Mix well and bring to a boil. Remove from heat and stir in the pasta. **In my case, my skillet wasn’t large enough, so I kept the pasta in the strainer and used the larger pot to combine all of the sauce. Then I added the pasta. 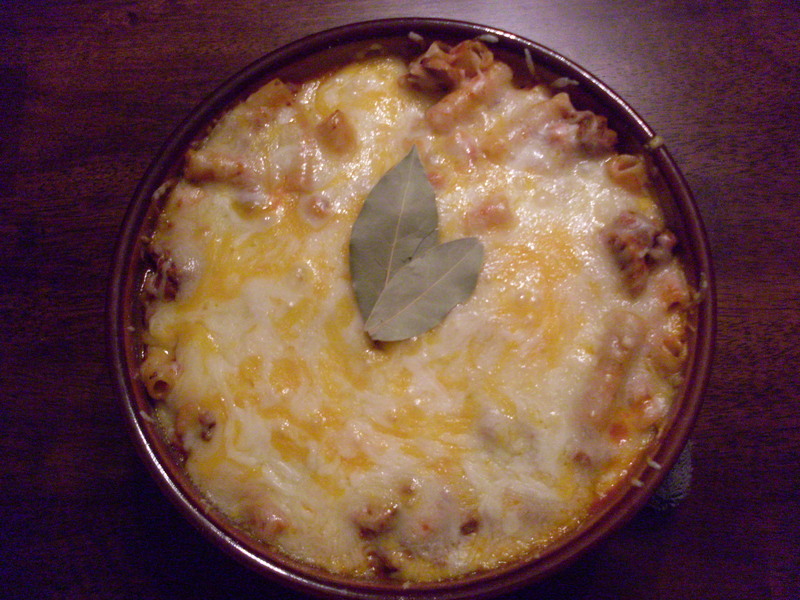 Spoon the pasta/sauce into the prepared casserole and bake, covered with foil, for 15 minutes. Uncover; top with the cheese and bake for another 5-10 minutes until the casserole bubbles and the cheese is melted. Makes 5-6 servings. Bachelor's degree in biology-chemistry; Masters in public health. Science nerd (and proud of it!). Wine-o, beer snob, and foodie! Always has a sense of humor and looks on the bright side. This entry was posted in Products, Recipes. Bookmark the permalink.